We're going to Marc's place. On se retrouvera chez Lucie. We'll meet at Lucie's place. Jean va chez le dentiste. John is going to the dentist's. Je suis chez le coiffeur. It can also be used in a more general sense to express "at home" or "in <someone's> life". Is everything good with you? When used in this context, 'maison' is closer to 'home' than literally 'house': and just as in English, you would never say "I'm going to my home", but "I'm going home", in French, you will never use "à ma maison / à ta maison...", but you will use instead the generic "à la maison". Il vient chez toi plus tard. He's coming to your place later. Je suis passé par chez elle ce matin. I passed by her place this morning. Aurélie va manger chez ses parents. 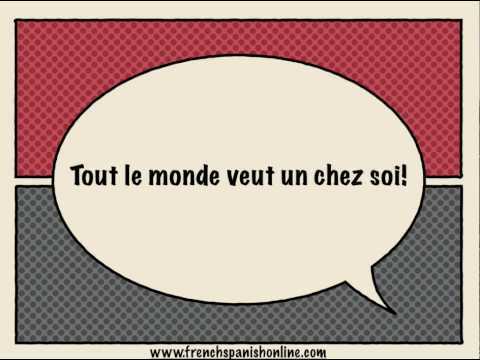 I just noticed rentre is the only verb not conjugated in expressions involving chez, in this lesson. This is not confirmed in the lesson. Is that because it translates as to go/return home and is being used in connection with the word for home? Merci. Sorry, I just realized that rentre is conjugated but it just looks like it is not conjugated in the Je and Il/elle/on forms. Yes, that's correct. Note also that the infinitive is rentrer. So, the missing r at the end is an indication that this must be a conjugated form and can't be the infinitive. "and just as in English, you would never say "I'm going to my home""
I think saying "never" here is incorrect. I can think of situations when I might say this. Thanks for writing. I'm American and would never say "I'm going to my home." Mostly I would say "I'm going home." In rare situations, I might say "I'm going to my house," such as in response to someone offering their house instead, but I honestly cannot think of a single situation in which I'd say "I'm going to my home" - it just sounds weird. As a rough guideline, whenever you would, in English, say "at someone's place" you use "chez" in French. "À la maison" is also in common use and means "at the house" or "at home". Tu es où ? -- Je suis à la maison. -- Where are you? I am at the house (at home). Nous allons chez Lucie = I am going to Lucie's house. I think what you were thinking of is, "Nous allons à la maison" not 'havons' which makes no sense . You cannot in this case say "Nous allons à la maison de Lucie" which sounds like what a very young child might say. Chez is one of those wonderful Fench words that conveys a multitude of meanings. of/with: C'est une conviction fondamentale chez moi - It is a fundamental belief of mine (with me). in (the works of): Le rôle de la socialisation chez Zola - The role of socialisation in (the works of) Zola. among: L'hypochondrie est répandue chez les Français - Hypochondria is widespread among the French. in (possesive pronoun) country : La réligion est sur le déclin chez nous - Religion is on the decline in our country. There are bound to be more uses that I cannot think of.